Ever since the twins were born in 2007, both my husband and I have been feeling very tired and out-of-shape. A few months after this pregnancy, I underwent a radioactive iodine treatment to get my Grave's Disease under control. This resulted in my thyroid becoming underactive, which resulted in weight gain for me. Although many people would say that a size 9 is about average, it doesn't feel average for someone who was a size 3 just ten years ago. When my husband and I were presented with the chance to try the Sensa weight loss system for 3 months, we decided to give it a try. The logic behind this product is that it can trick your brain into thinking you are full by using your sense of taste and smell. All you need to do is sprinkle the Sensa on everything you eat for 6 months. I have to admit that my husband and I are skeptical, but we are open to the possibility that this product might work if we make some other small changes in our lifestyle, like drinking a little less soda and exercising more frequently. We just started using Sensa a week ago. The only thing I have to report so far is that after the first day or two, I couldn't detect the Sensa on my food anymore. The first two days I thought I could taste the slightest hint of chalkiness, but I could not be sure. It definitely does not change the taste of my food. The one problem I am having is actually remembering to sprinkle the Sensa on my food. Life is very hectic in my house with 3 young children. Sometimes I don't remember the Sensa until I am more than halfway through my meal and sometimes I don't remember it at all. Even my husband, who was really gung-ho about trying Sensa the first few days, has started forgetting to use it all the time. 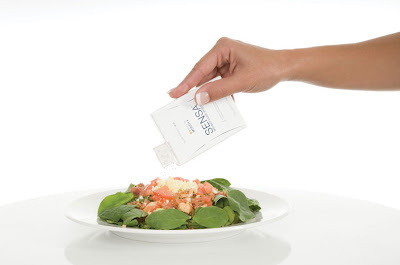 Does anyone have any suggestions about how we can remember to sprinkle Sensa on our food every time we eat? I will update you on our progress after the first month has passed.